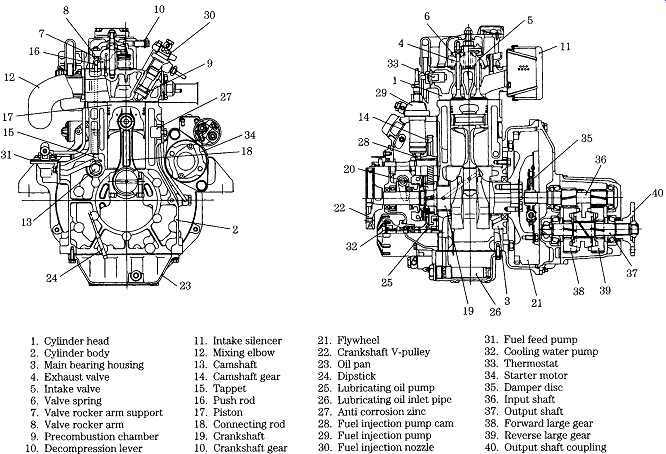 At first glance, a diesel engine looks like a heavy-duty gasoline engine, minus spark plugs and ignition wiring ( FIG. 1). Some manufacturers build compression ignition (CI) and spark ignition (SI) versions of the same engine. Caterpillar G3500 and G3600 SI natural-gas fueled engines are built on diesel frames and use the same blocks, crankshafts, heads, liners, and connecting rods. But there are important differences between CI and SI engines that cut deeper than the mode of igniting the fuel. When air is compressed, collisions between molecules produce heat that ignites the diesel fuel. The compression ratio (c/r) is the measure of how much the air is compressed ( FIG. 2). 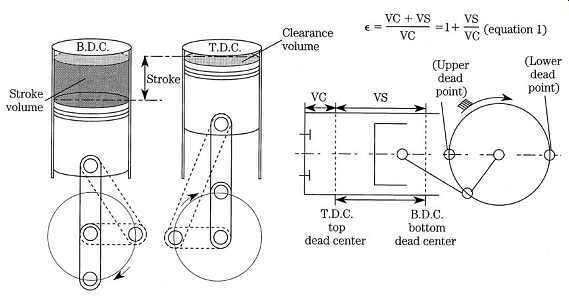 Compression ratio _ swept volume _ clearance volume _ swept volume Swept volume _ the volume of the cylinder traversed by the piston in its travel from top dead center (tdc) to bottom dead center (bdc) Clearance volume _ combustion chamber volume FIG. 3 graphs the relationship between c/r's and thermal efficiency, which reaffirms what every mechanic knows: high c/r's are a precondition for power and fuel economy. FIG. 1 The Yanmar 1GM10, shown with a marine transmission, provides auxiliary power for small sailboats. The 19.4 CID unit develops 9 hp and forms the basic module for two- and three-cylinder versions. FIG. 2 Compression ratio is a simple concept, but one that mathematics and pictures express better than words. FIG. 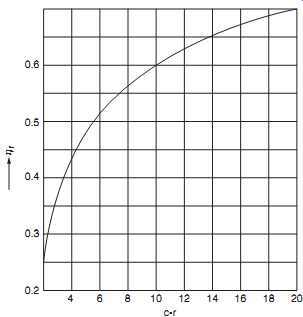 3 The relationship between diesel compression ratios and thermal efficiency. At the very minimum, a diesel engine needs a c/r of about 16:1 for cold starting. Friction, which increases more rapidly than the power liberated by increases in compression, sets the upper limit at about 24:1. Other inhibiting factors are the energy required for cranking and the stresses produced by high power outputs. Diesels with c/r's of 16 or 17:1 sometimes benefit from a point or two of higher compression. Starting becomes easier and less exhaust smoke is produced. An example is the Caterpillar 3208 that has a tendency to smoke and "wet stack," that is, to saturate its exhaust system with unburned fuel. These problems can be alleviated with longer connecting rods that raise the compression ratio from 16.5:1 to 18.2:1. It should be noted that a compressor, in the form of a turbocharger or super charger, raises the effective c/r. Consequently, these engines have c/r's of 16 or 17:1, which are just adequate for starting. Once the engine is running, the compressor pro vides additional compression. Gasoline engines have lower c/r's-half or less-than CI engines. This is because the fuel detonates when exposed to the heat and pressure associated with higher c/r's. Detonation is a kind of maverick combustion that occurs after normal ignition. The unburned fraction of the charge spontaneously explodes. This sudden rise in pressure can be heard as a rattle or, depending upon the natural frequency of the connecting rods, as a series of distinct pings. Uncontrolled detonation destroys crankshaft bearings and melts piston crowns. Modern SI engines mix air and fuel in the intake manifold by way of one or more low-pressure (50-psi or so) injectors. A throttle valve regulates the amount of air admitted, which is only slightly in excess of the air needed for combustion. As the throttle opens, the injectors remain open longer to increase fuel delivery. For a gasoline engine, the optimum mixture is roughly 15 parts air to 1 part fuel. The air-fuel mixture then passes into the cylinder for compression and ignition. In a CI engine, air undergoes compression before fuel is admitted. Injectors open late during the compression stroke as the piston approaches tdc. Compressing air, rather than a mix of air and fuel, improves the thermal efficiency of diesel engines. To understand why would require a course in thermodynamics; suffice to say that air contains more latent heat than does a mixture of air and vaporized fuel. Forcing fuel into a column of highly compressed air requires high injection pressures. These pressures range from about 6000 psi for utility engines to as much as 30,000 psi for state-of-the-art examples. CI engines dispense with the throttle plate-the same amount of air enters the cylinders at all engine speeds. Typically, idle-speed air consumption averages about 100 lb of air per pound of fuel; at high speed or under heavy load, the additional fuel supplied drops the ratio to about 20:1. Without a throttle plate, diesels breathe easily at low speeds, which explains why truck drivers can idle their rigs for long periods without consuming appreciable fuel. (An SI engine requires a fuel-rich mixture at idle to generate power to over come the throttle restriction.) Since diesel air flow remains constant, the power output depends upon the amount of fuel delivered. As power requirements increase, the injectors deliver more fuel than can be burned with available oxygen. The exhaust turns black with partially oxidized fuel. How much smoke can be tolerated depends upon the regulatory climate, but the smoke limit always puts a ceiling on power output. To get around this restriction, many diesels incorporate an air pump in the form of an exhaust-driven turbocharger or a mechanical supercharger. Forced induction can double power outputs without violating the smoke limit. And, as far as turbochargers are concerned, the supercharge effect is free. That is, the energy that drives the turbo would otherwise be wasted out the exhaust pipe as heat and exhaust-gas velocity. The absence of an air restriction and an ignition system that operates as a function of engine architecture can wrest control of the engine from the operator. All that's needed is for significant amounts of crankcase oil to find its way into the combustion chambers. Oil might be drawn into the chambers past worn piston rings or from a failed turbocharger seal. Some industrial engines have an air trip on the intake manifold for this contingency, but many do not. A runaway engine generally accelerates itself to perdition because few operators have the presence of mind to engage the air trip or stuff a rag into the intake. SI engines are fired by an electrical spark timed to occur just before the piston reaches the top of the compression stroke. Because the full charge of fuel and air is present, combustion proceeds rapidly in the form of a controlled explosion. The rise in cylinder pressure occurs during the span of a few crankshaft degrees. Thus, the cylinder volume above the piston undergoes little change between ignition and peak pressure. Engineers, exaggerating a bit, describe SI engines as "constant volume" engines ( FIG. 4). Compared to SI, the onset of diesel ignition is a leisurely process ( FIG. 4). Some time is required for the fuel spray to vaporize and more time is required for the spray to reach ignition temperature. Fuel continues to be injected during the delay period. Once ignited, the accumulated fuel burns rapidly with correspondingly rapid increases in cylinder temperature and pressure. The injector continues to deliver fuel through the period of rapid combustion and into the period of controlled combustion that follows. When injection ceases, combustion enters what is known as the afterburn period. The delay between the onset of fuel delivery and ignition (A-B in FIG. 5) should be as brief as possible to minimize the amount of unburnt fuel accumulated in the cylinder. The greater the ignition lag, the more violent the combustion and resulting noise, vibration, and harshness (NVH). Ignition lag is always worst upon starting cold, when engine metal acts as a heat sink. Mechanics sometimes describe the clatter, white exhaust smoke, and rough combustion that accompany cold starts as "diesel detonation," a term that is mis leading because diesels don’t detonate in the manner of SI engines. Combustion should smooth out after the engine warms and ignition lag diminishes. Heating the incoming air makes cold starts easier and less intrusive. In normal operation, with ignition delay under control, cylinder pressures and temperatures rise more slowly (but to higher levels) than for SI engines. In his proposal of 1893, Rudolf Diesel went one step further and visualized constant pressure expansion: fuel input and combustion pressure would remain constant during the expansion, or power, stroke. He was able to approach that goal in experimental engines, but only if rotational speeds were held low. His colleagues eventually abandoned the idea and controlled fuel input pragmatically, on the basis of power output. Even so, the pressure rise is relatively smooth and diesel engines are sometimes called "constant pressure" devices to distinguish them from "constant volume" SI engines (shown back at FIG. 4). FIG. 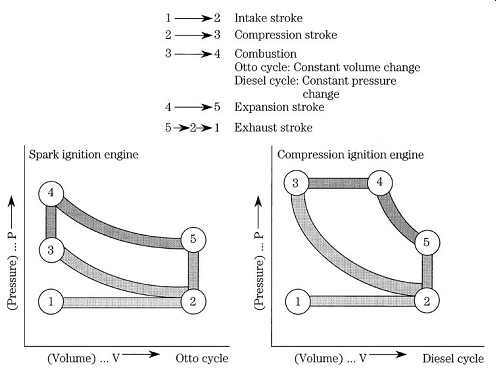 4 These cylinder pressure/volume diagrams distort reality somewhat, but indicate why SI engines are described as "constant volume" and CI as "constant pressure." FIG. 5 Diesel combustion and compression pressure rise plotted against crankshaft rotation. FIG. 6 Four-cycle operation. Yanmar Diesel Engine Co. Ltd. FIG. 7 Two-cycle operation. The Detroit Diesel engine depicted here employs a Roots-type positive-displacement blower for scavenging. CI and SI engines operate on similar cycles, consisting of intake, compression, expansion, and exhaust events. 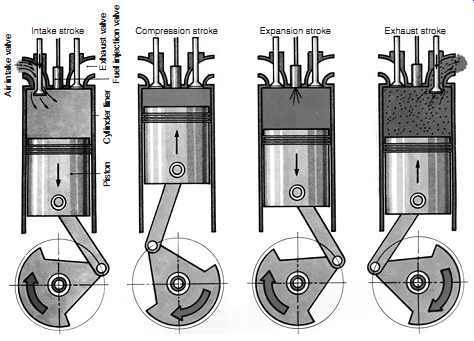 Four-stroke-cycle engines of either type allocate one up or down stroke of the piston for each of the four events. Two-stroke-cycle engines telescope events into two strokes of the piston, or one per crankshaft revolution. In the United States, the term stroke is generally dropped and we speak of two- or four-cycle engines; in other parts of the English-speaking world, the preferred nomenclature is two-stroke and four-stroke. 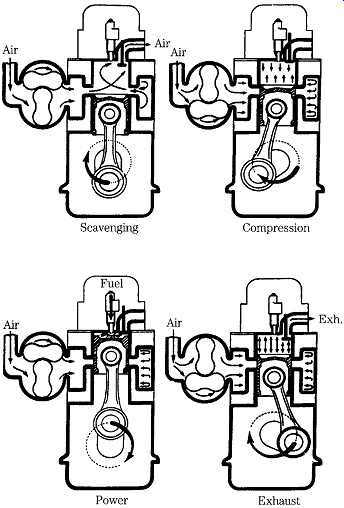 Four-cycle diesel engines operate as shown in FIG. 6. Air, entering around the open intake valve, fills the cylinder as the piston falls on the intake stroke. The intake valve closes as the piston rounds bdc on the compression stroke. The piston rises, compressing and heating the air to ignition temperatures. Injection begins near tdc on the compression stroke and continues for about 40° of crankshaft rotation. The fuel ignites, driving the piston down in the bore on the expansion, or power stroke. The exhaust valve opens and the piston rises on the exhaust stroke, purging the cylinder of spent gases. When the piston again reaches tdc, the four-stroke-cycle is complete, two crankshaft revolutions from its beginning. FIG. 7 illustrates the operation of Detroit Diesel two-cycle engines, which employ blower-assisted scavenging. As shown in the upper left drawing, pressurized air enters the bore through radial ports and forces the exhaust gases out through the cylinder without raising its pressure much above atmospheric. The exhaust valve remains open until the ports are closed to eliminate a supercharge effect. FIG. 8 Cross-flow scavenging employs a deflector on the piston crown to divert the incoming air charge up and away from the exhaust port. Loop scavenging achieves the same effect with angled inlet ports. The exhaust valve then closes and the piston continues to rise, compressing the air charge ahead of it. Near tdc, the injector fires, combustion begins, and cylinder pressure peaks as the piston rounds tdc. Expanding gases drive the piston down ward. The exhaust valve opens just before the scavenge ports are uncovered to give spent gases opportunity to blow down. These four events-intake, compression, expansion, and exhaust-occur in two piston strokes, or one crankshaft revolution. Not all two-cycle diesel engines have valves. Combining scavenge air with combustion air eliminates the intake valve, and a port above the air inlet port replaces the exhaust valve. Such engines employ cross-flow or loop scavenging ( FIG. 8) to purge the upper reaches of the cylinder and to minimize the loss of scavenge air to the exhaust. In the cross-flow scheme, a deflector cast into the piston crown diverts the incoming air stream away from the open exhaust port and into the stagnant region above the piston. The angled inlet ports on loop-scavenged engines produce the same effect. It’s also possible to eliminate the external air pump by using the crankcase as part of the air inlet tract. Piston movement provides the necessary compression to pump the air, via a transfer port, into the cylinder. Not many crankcase-scavenged engines are seen in this country, but the German manufacturer Fichtel & Sachs has built thousands of them. Because two-cycle engines fire every revolution, the power output should be twice that of an equivalent four-stroke. Such is not the case, principally because of difficulties associated with scavenging. Four-cycle engines mechanically purge exhaust gases, through some 440° of crankshaft revolution. (The exhaust valve opens early during the expansion stroke and closes after the intake valve opens). Two cycles scavenge in a less positive manner during an abbreviated interval of about 130°. Consequently, some exhaust gas remains in the cylinder to dampen combustion. Horsepower is the ability to perform work over time. In 1782, James Watt, a pioneer developer of steam engines, observed that one mine pony could lift 550 lb of coal one foot in one minute. Torque is the instantaneous twisting force applied to the crankshaft. In the English-speaking world, we usually express torque as pounds of force applied on a lever one foot long. Horsepower _ torque _ 2pi _ rpm. Revolutions per minute is the time component. Torque _ displacement _ 4pi _ bmep. The latter term, brake mean effective pressure, is the average pressure applied to the piston during the expansion stroke. High-performance diesels, such as used in European automobiles, develop maximum horsepower at around 5000 rpm. Equivalent SI auto engines can turn almost twice as fast. Since rpm is part of the hp formula, these diesels fall short in the power department. An SI-powered car will have a higher top speed. But, thanks to high effective brake mean pressures, diesels have the advantage of superior torque. A diesel-powered BMW or Mercedes-Benz easily out-accelerates its gasoline-powered cousins. High c/r's (or more exactly, large ratios of expansion) give CI engines superior thermal efficiency. Under optimum conditions, a well-designed SI engine utilizes about 30% of the heat liberated from the fuel to turn the crankshaft. The remainder goes out the exhaust and into the cooling system and lubricating oil. CI engines attain thermal efficiencies of 40% and greater. By this measure-which is becoming increasingly critical as fears about global warming are confirmed-diesel engines are the most efficient practical form of internal combustion. (Gas turbines do better, but only at constant speeds.) Excellent thermal efficiency, plus the volumetric efficiency afforded by an unthrottled intake manifold and the ability to recycle some exhaust heat by turbocharging, translate into fuel economy. It’s not unreasonable to expect a specific fuel consumption of 0.35 lb/hp-hr from a CI engine operating near its torque peak. An SI engine can consume 0.50 lb/hp-hr under the same conditions. The weight differential between diesel fuels (7.6 lb/US gal for No. 2D) and gasoline (about 6.1 lb/US gal) gives the diesel an even greater advantage when consumption is figured in gallons per hour or mile. CI passenger cars and trucks deliver about 30% better mileage than the same vehicles with gasoline engines. Diesel pickups and SUVs appeal in ways other than fuel economy. Owners of these vehicles tend to become diesel enthusiasts. I'm not sure why, but it probably has something to do with the sheer mechanical presence that industrial products radiate. Earlier generations had the same sort of love affair with steam. The Cummins ISB Dodge pickup motor weighs 962 lb and develops 260 hp for a wt/hp ratio of 3.7:1. The 500-hp Caterpillar 3406E, a standard power plant for large (Grade-8) highway trucks comes in at 5.7 lb/hp. The Lugger, a marine engine of legendary durability, weighs 9.6 lb for each of its 120 horses. By comparison, the Chevrolet small block SI V-8 has an all-up weight of about 600 lb and with a bit of tweaking develops 300 hp. Much of the weight of diesel engines results from the need to contain combustion pressures and heat that, near tdc, peak out at around 1000 psi and 3600°F. And, as mentioned earlier, bmep, or average cylinder pressures, are twice those of SI engines. There are advantages to being built like a Sumo wrestler. 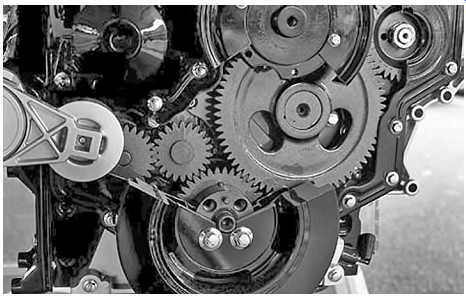 Crankshaft bearings stay in alignment, cylinder bores remain round, and time between overhauls can extend for tens of thousands of hours. Industrial diesel engines come out of a conservative design tradition. High initial costs, weight, and moderate levels of performance are acceptable tradeoffs against early failure. The classic diesel is founded on heavy, fine-grained iron castings, liberally reinforced with webbing and aged prior to machining. 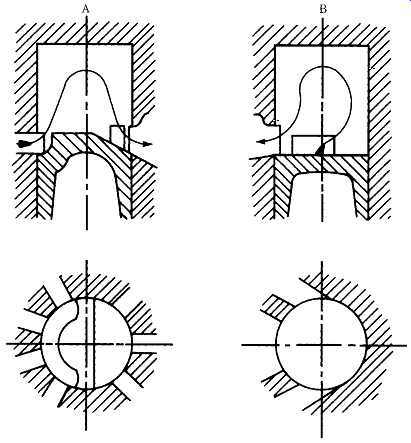 Buttressed main-bearing caps, pressed into the block and often cross-drilled, support the crank shaft. Pistons run against replaceable liners, whose metallurgy can be precisely con trolled. Some of the better engines, such as the Cummins shown in FIG. 9, feature straight-cut timing gears, which are virtually indestructible. Until exhaust gas recirculation became the norm, heavy truck piston rings could, on occasion, go for a million miles between replacements. An early Caterpillar 3176 truck engine was returned to the factory for teardown after logging more than 600,000 miles. Main and connecting-rod bearings had been replaced (at 450,000 and 225,000 miles, respectively) and were not available for examination. The parts were said to be in good condition. The crankshaft remained within tolerance, as did the rocker arms, camshaft journals, and lower block casting. Valves showed normal wear, but were judged reusable. Connecting rods could have gone another 400,000 miles and pistons for 200,000 miles. The original honing marks were still visible on the cylinder liners. But Caterpillar was not satisfied, and has since made a series of major revisions to the 3176, including redesigned pistons, rings, connecting rods, head gasket, rocker shafts, injectors, and water pump. Crankshaft rigidity has been improved, and tooling developed to give the cylinder liners an even more durable finish. Durability is not a Caterpillar exclusive: according to the EPA, heavy-truck engines have an average life cycle of 714,000 miles. Not a few Mercedes passenger cars have passed the three-quarter-million mile mark with only minor repairs. This is not to say that diesels are zero-defect products. Industrial engines are less than perfect, and when mated with digital technology the problems multiply. Many of the worst offenders are clones, that is, diesels derived from existing SI engines. No one who was around at the time can forget the 1978 Oldsmobile Delta 88 Royale that sheared head bolts, crankshafts, and almost everything in between. Another clone that got off to a bad start was the Volkswagen. Like the Olds, it had problems with fasteners and soft crankshafts. But these difficulties were overcome. Today the VW TDi is the most popular diesel passenger-car engine in Europe, accounting for 40% of Volkswagen's production. FIG. 9 The Cummings ISB employs straight-cut timing gears that, while noisy, are practically indestructible. Gilmer-type toothed timing belts, typical of passenger-car diesels, need replacement at 60,000 miles or less. Diesel fuel is a middle distillate, slightly heavier than kerosene or jet fuel. Composition varies with the source crude, the refining processes used, the additive mix, and the regulatory climate. ASTM (American Society for Testing Materials) norms for Nos. 1-D and 2-D fuels in the United States are shown in TBL. 1. TBL. 2 lists characteristics the EPA considers typical for Nos. 1-D and 2-D ULSD sold outside of California, which has its own, more rigorous rules. Note that EPA regulations apply only to sulfur content and to cetane number/aromatic content. Other fuel qualities, such as lubricity, filterability, and viscosity, are left to the discretion of the refiner. As a general rule, large truck stops provide the best, most consistent fuel. • Cetane number (CN) and aromatic content refer to the ignition quality of the fuel. U.S. regulations permit 40 CN fuel if the aromatic content does not exceed 35%. In Europe diesel fuel must have a CN of at least 51. Aromatic content expresses the ignition quality of the fuel. High-octane fuels, such as aviation gasoline, have low CNs and barely support diesel combustion. Conversely, ether and amyl nitrate, which detonate violently in SI engines, are widely used as diesel starting fluids. • API (American Petroleum Institute) gravity is an index of fuel density and, by extension, its caloric value. Heavier fuels produce more energy per injected volume. • Viscosity also affects performance. Less viscous fuels atomize better and produce less exhaust smoke. But extremely light fuel upsets calibration by leaking past pump plungers. Thick, highly viscous fuels increase delivery pressures and pumping loads. • Flash point, or the temperature at which the fuel releases ignitable vapors, is a safety consideration.